Discussion in 'Calibration, Help, and Troubleshooting' started by R Design, May 1, 2016. I've been printing more at 0.1mm and there are bands that were scarcely perceptible at 0.25mm. Generally they amount to one layer that has shifted the tiniest amount to the right and front.... just enough to create a line. Usually after one layer it then returns to where it was before. I don't think it's the Z-axis because the bands vary from part to part. And because I can't "force" bands to appear by pushing a bit on the side of the bed during printing. The bands are however more frequent when there is more "going on" on the layers. So it makes me think it's somehow related to the X-Y motion. However decreasing the speed - both of printing and of XY movements - makes no difference. Can you post an image so we can guess better? Is the banding at a regular interval? This is the worst example I could find. The bands are horrible, partly because of the diagonal morning sunlight and partly - I think - because I forgot to chamfer / fillet the corners of the part and so perhaps the nozzle direction changes were very brusque? How are your bearings on the bed? Are they smooth all the way or could it be they get slightly stuck with uneven motion. Maybe this is showing only in very small z movements. When I put it together the bearings seemed OK. But you're right, with these bearings we're always going to have doubts. And doubts is a killer. I got some misumi bearings and they ride smooth as silk. Even wondering if the balls are rolling at all. 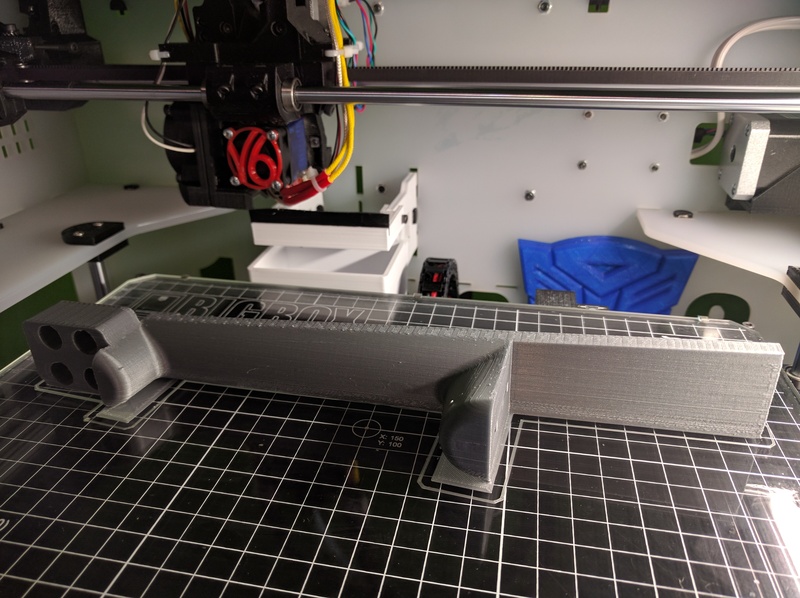 On the thingiverse page for the BB under remixes Greg's posted a Z-axis IR sensor alternative that might interest you if the build is not too far advanced: the sensor goes not on the print head but on the print bed! I started looking at print bands under the USB microscope and decided that there is some Z variation between layers bands where bands are occurring. This is a case of a bearing getting worse / going bad in usage (I think it was OK at the start). These things are obviously a false economy. So now I'm going to look through the forum and try to understand where to get these Misumi things. But if I remember rightly you can't order them in Europe if you don't have a company or something? But if I remember rightly you can't order them in Europe if you don't have a company or something? You have enough for the Z-axis (4) in your drawer? Well I'd be very grateful to either of you. I have two spares... Will have to order more if you want me to. @fpex what are your stock levels like? OK thanks. I'm in Brussels. FIrst I'll get the 2 that Alex has. Hopefully that way I can be printing again on Friday. Also that will give me a chance to examine them. My understanding is that for 3d printing there's no need for high performance bearings. It should be enough that they don't jam! However having one that was working OK "turn bad" on me - and the inconvenience that brings - is giving me second thoughts about the Chinese route. I mean, even if you have a draw full of Chinese bearings, it's not easy to check whether maybe one needs changing. I just looked at the map.